R2-D2, you dirty dawg, you! Who would have thought that this vertically challenged droid would actually have a rather naughty side to it? Otherwise, what the heck is it doing hiding under a skirt? Wait a minute, upon closer inspection, it seems that this is one interesting fashion statement which one can make – in the form of the $39.99 R2-D2 Skirt, of course. The R2-D2 Dome Circle Skirt is made from 96% polyester and 4% spandex, where you would need to machine wash it cold, making this a waterproof droid for sure. 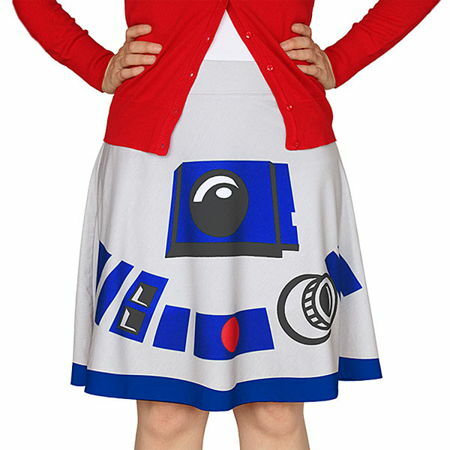 It might not be the droid you’re looking for, but it definitely is this season’s fashionable skirt that you want!